Could his brand really be bigger than the WSOP? Joan Rivers’ nemesis’ brother’s online poker company could learn a lot from Trump about how to run a company into the ground and still be rich. Oh yeah, and now Donald Trump wants in on online poker … should the Feds re-legalize it anytime soon. He’s apparently partnered with New York hedge fund manager Marc Lasry with the intent of entering into the online gambling space as soon as the US opens the hatch. Not a surprise. Trump got in, then out, of poker early in the boom (remember the US Poker Championships in Atlantic City?). 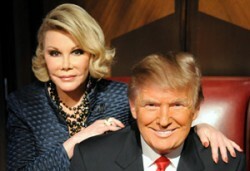 That was a few years before Joan Rivers beat Annie Duke heads-up on Celebrity Apprentice. Trump’s 29-year-old daughter, Ivanka, explains the partnership as Trump Entertainment contributing the gambling licenses, Lasry putting up the capital, and The Donald offering his name and likeness to recruit future players.